Family homes come in all shapes and sizes. Today we’d like to share one with you that comes in the most surprising of packages! The Edge House was carefully constructed on an awkward parcel of land. It manages to fit a modern family home with plenty of outdoor space to boot. With striking mountain views and expansive open plan designs, it’s easy to forget this house is in the big city. We love it when architects innovate to create comfortable family homes in an urban setting. Inside you’ll find a white palette paired with natural grains of wood. Plenty of glazing and sleek modern fixtures make it a bright and functional home for a family. Let’s take a look at how an urban family lives on the edge! This is the Edge House! The ground level garage has a courtyard garden on top. A slate grey stone wall couples with dark wood to make a warm and masculine design. The light beige of the home helps make the look less severe. Few windows on this side of the home ensure privacy. A two car garage sits beside the entrance. Once through the gate there are some stairs up to the entrance of the house. The land in which the home lies spreads in a fan shape. Since this was a difficult parcel of land to work with, the home is built to sit on the edge of the lot. 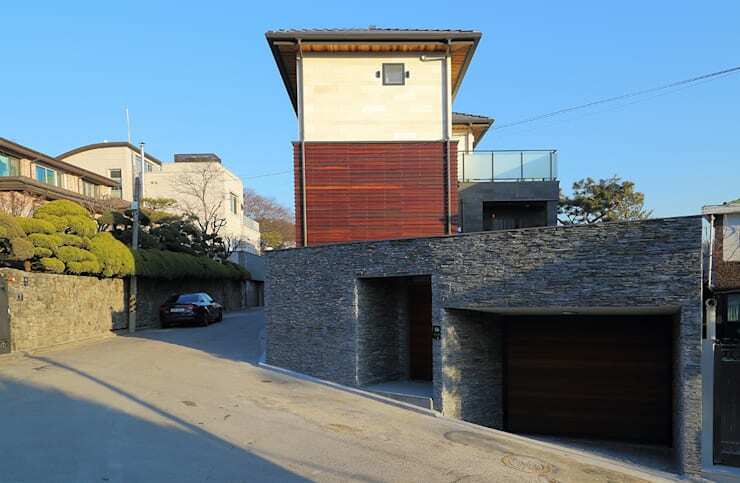 We love the cherry stained wood panels on the exterior of the home. 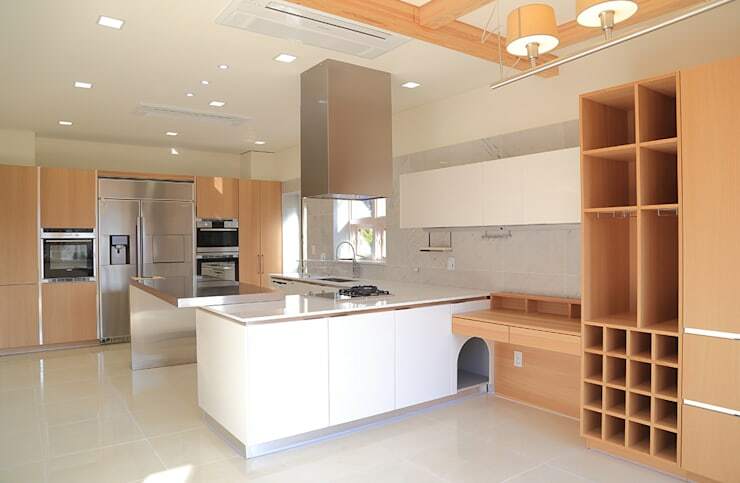 The architects have created a home in a crowded city with enough space for a family to enjoy life with peace of mind. 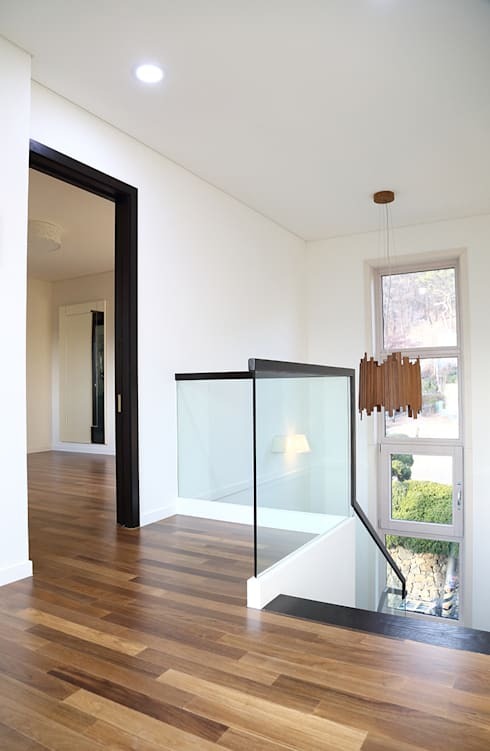 Going through the gate and up the stairs to the home we get a sense of a modern space. 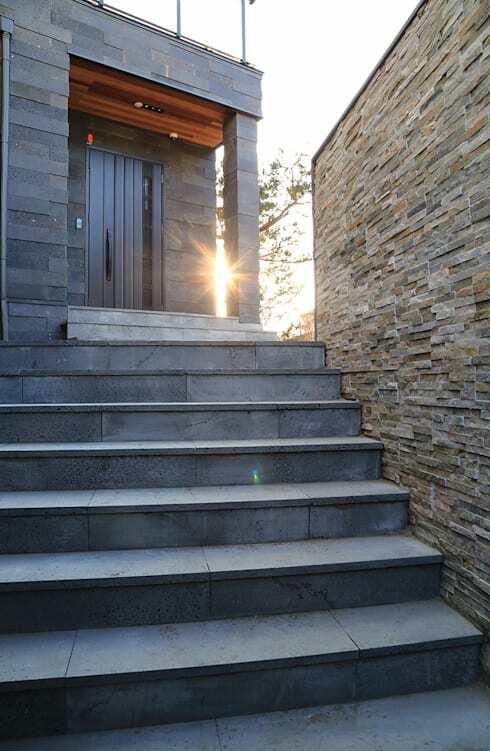 The darkness of the stones used in the stairs and on the front of the home make it elegant while the natural looking beige stones bring a little balance and harmony to the view. Climbing the stairs as the sun rises through the covered entryway is a wonderful sight. 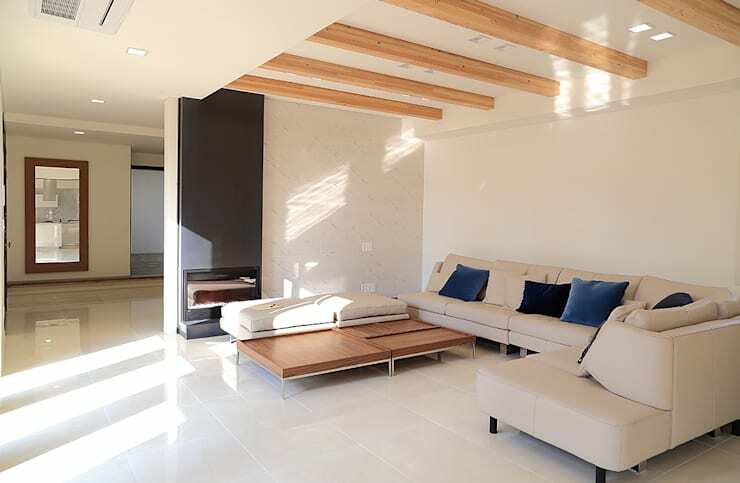 Wood finishes in the ceiling and on the door give more warmth and invite natural elements to the home. The first floor responds direct to the client's needs. They wanted a family home where they could enjoy life together. The architects used an open plan to take advantage of the available space in the home so that they could accommodate a 4 person family. Exposed wooden beams add a warm feel to the interior. The ivory marble floor is mirrored by the painted walls and ceilings. The homes of the wall are interesting in and of themselves. Walls needed to be thin in this project to fit the lot. 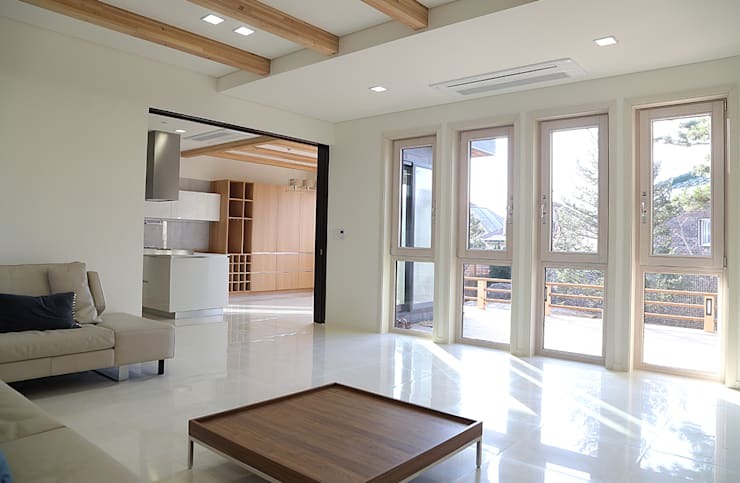 They used a high performance insulation and minimal wall thickness to produce a home that was energy efficient and flexible enough to fit on the lot. The low to the ground furniture is comfortable and modern. there is a slim black fireplace perfect for warming up on cold nights together with your family. The space feels open and expansive. This view from the living room gives us a peak of the kitchen and dining space. Looking out the glazed front of the room we can see into the main floor terrace area and the garden. Light pours in through long windows and glass doors. The courtyard was established to provide some privacy for the family. Natural elements and materials help make the home comfortable for the family who love the feeling of being close to nature. A terrace like this could be used for outdoor entertaining or just a fun space for the kids to enjoy. This is a multipurpose room that responds to the needs of the family. The kitchen is large with impressive countertops. There’s a pet alcove carved out in the front, along the wall. That’s a clever use of space! There is a built in desk making this space also function as an office. Perfect for kids doing their homework while their parents finish making dinner. The dining space would be in this room, too. Built in storage and shelving in this room make it a functional family hub. The stairway to the second floor helps to rise above the city, towards the mountains and sky. 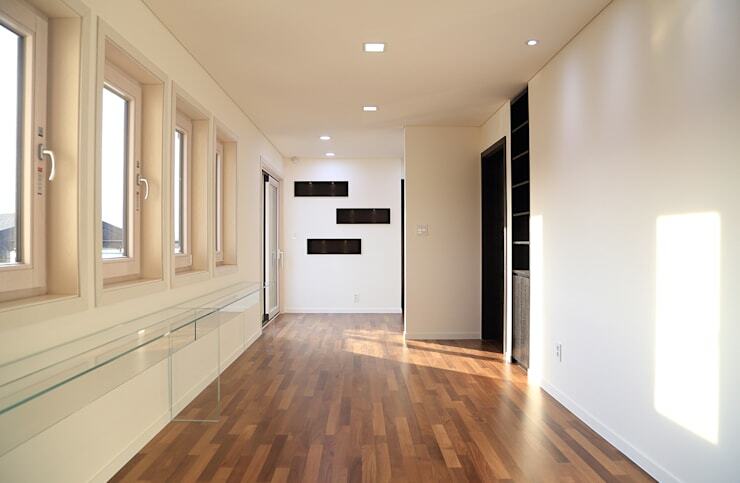 The natural wood finish of the floor is earthy and rich. The black railings of the stairs have a clean and stylish feel. They play with the purity and brightness of the white in the room. The banisters keep the views free and wide to allow more light to come inside. Upstairs are the bedrooms and a small family room where they can be comfortable and take in the view. This narrow family room is full of interesting features and has an open space within. Great for kids who need room to run around. This living room is flexible and has a lot of potential. It would make a great library or playroom. The clear shelf along the wall is a stylish addition to the room and could be used as a workspace or storage space. The patio is accessed at the far end of the room by the stairs landing. That’s where the best views are to be had. 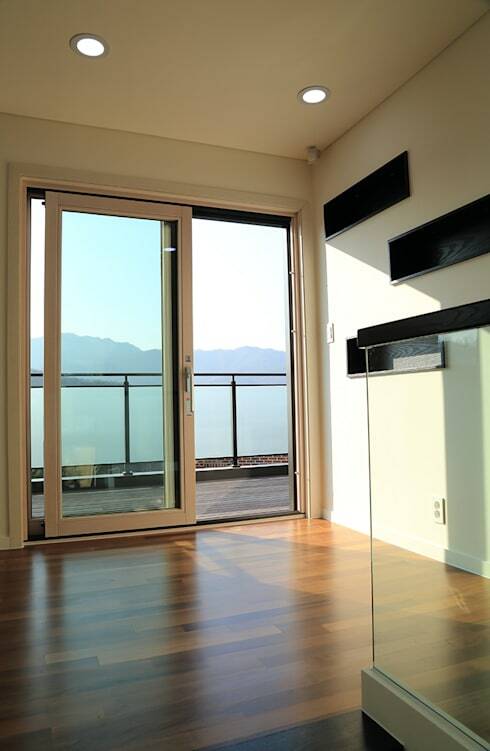 Let’s end our tour by sneaking a peek at the view this house has to offer. Built on the edge, it’s no wonder this unique house boasts spectacular views. This home has been surprisingly modern and family friendly from start to finish. Thanks for taking a tour of the Edge House with us! For more family home inspiration, check out our feature on a low-maintenence family home. Would you like to live on the edge?